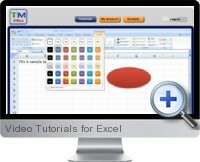 Video Tutorials for Excel provide fast and convenient training for a wide range of aspects of Excel functionality. These high definition video tutorials for Excel (as well as Word and PowerPoint) can be used on an individual basis or as an organization wide subscription. High Definition Video Tutorials: Play, pause, and rewind through the HD and HQ video tutorials whenever and as often as required. Full Screen Viewable: High resolution ensures that details are never missed. Download Sample Files: Video source files can be downloaded and used to work along with the instructor in order to gain a better understanding of the subject being covered. Custom Bookmarking: Easily find relevant tutorials by searching within full descriptions. Result appear below the video player for convenient and immediate access. Create Tutorial Categories: Create, name and add to categories of tutorials, for example, a collection of Excel functions or features that you use most often.